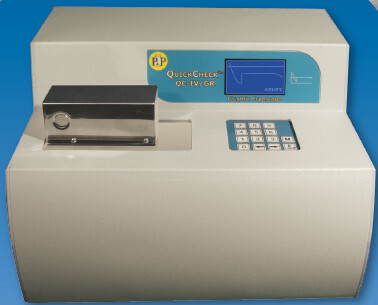 QuickCheck™ -IV/GR Cryoscope | Page & Pedersen International ltd. Testing milk for extraneous water in accordance with internationally reviewed and recommended methods (AOAC, IDF 108:2009 & ISO 5764:2009), the QC-IV/GR ensures that incoming milk is not adulterated with added water for payment purposes. Also, the QC-IV/GR provides a critical control check for processed milk and confirms proper balance in cheese, yogurt and ice-cream recipes. (see ISO 5764:2009, IDF 108:2009 and AOAC), the QC-IV/GR provides ultra-accurate results in ~ 90 seconds. QC-IV/GR is designed to provide you with years of dependable service. The LACTICAL™ milk-based controls and easy, intuitive procedures facilitate calibration validation as required. User-friendly operation ensures that real-time results are ready anytime; on demand! Whether your testing needs are for payment purposes, product development or simply to confirm positives from screening tests, the QuickCheck Cryoscope offers steadfast accuracy and unwavering precision to faithfully fulfill a wide variety of requirements. ºC or ºH configuration must be confirmed at the time of the order.